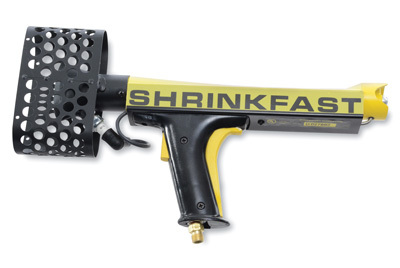 Handheld, propane-powered heat gun tightly shrinks giant poly bags or film around a wrapped pallet in less than two minutes. Completely portable, weighs less than 4 lbs., and requires minimal training and set-up time. Includes hose and regulator valve which easily attach to a propane tank (not included). No electrical connection required. Safety trigger prevents accidental discharge, and safety check valve limits gas leakage if damaged. Unit automatically shuts off when set down or dropped.